We really had a wonderful time! 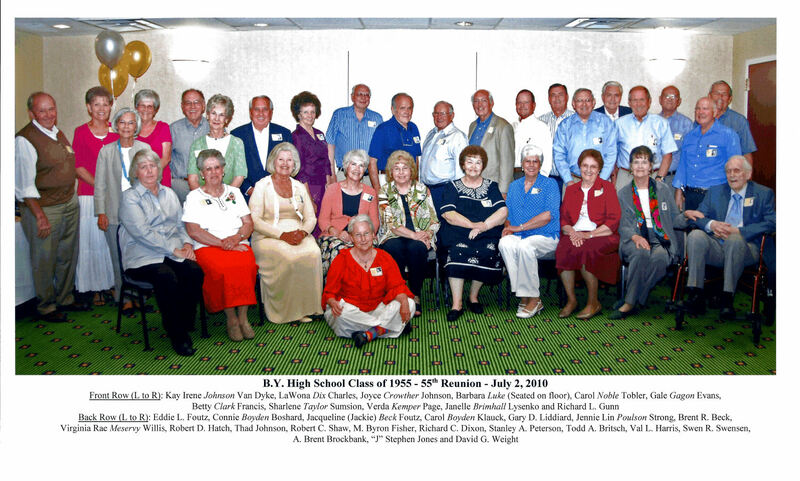 There were 30 class members at the reunion out of the 75 who graduated. Seventeen have passed away thus far. Our reunion was held in the Centennial Room at the Courtyard Marriot Hotel in Provo. Todd Britsch was our chairman this year and did a masterful job of arranging and getting everything organized. A wonderful meal was catered, and everyone had all they wanted to eat. We had as our special guest Brother Richard L. Gunn, our art and religion teacher, along with his wife. He is now totally blind, but did share his humor with us and we in turn each had an opportunity to express our love and thanks to him. He, along with some of us who are ailing, may not be with us much longer, but we want each of you to know how much we love and appreciate all of the contributions you have made in our lives. After our meal we pushed back the tables, took a class picture with those who were present, and then put our chairs in a big circle. For the next hour or so, each class member took a couple of minutes and shared some of their remembrances. Perhaps the prevailing theme of what was said during this time was how much each one has enjoyed our relationships over the years. The Bottle Band -- less Grant Miller who was unable to attend, and Bob Bentley who passed away several years ago -- shared what they were able. The mind has rendered some forgetfulness and ability, even though the desire was there! Brent couldn't find any 20 oz glass bottles to use, so he held the microphone. He is also waiting on a liver transplant. A tape of a past performance was shared with the remaining members -- Bob Shaw, Swen Swenson, David Weight and Brent Brockbank -- going through the motions. 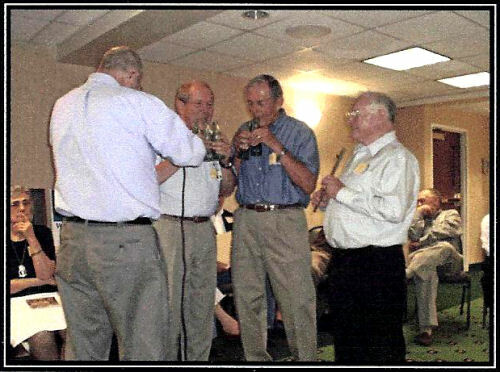 We had four at this reunion who had never been or hadn't attended in many, many years. 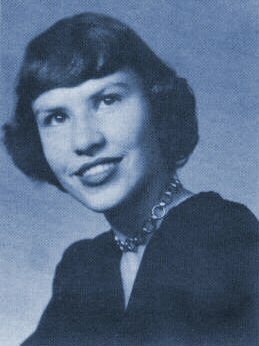 Among these were Verda Kemper Page, Carol Boyden Kauck and her twin sister Connie Boyden Boshard, and Barbara Luke. 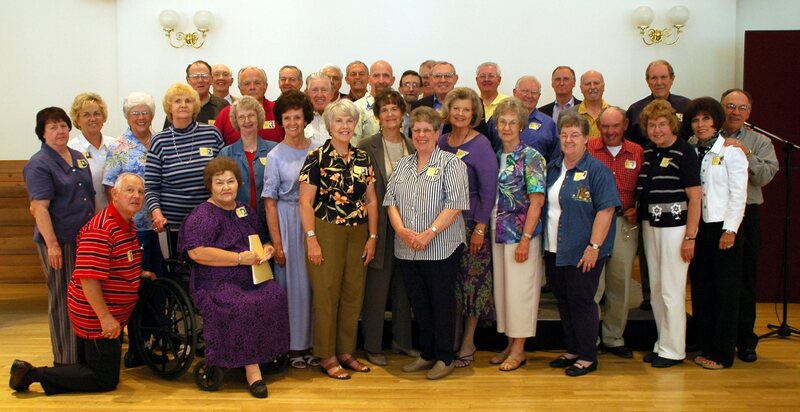 Next time our reunion will be our 60th, and we hope all of the remaining class members will be able to be with us. To everyone, please keep us updated on what is happening in your lives. Send a photo or two and some updated information to me, and I'll see that it is placed in our 60th Reunion booklet. 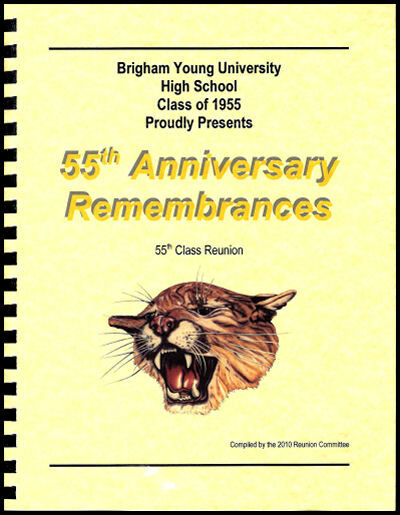 We want to share our 55th Reunion booklet with everyone who was not able to attend. If you don't receive one, drop me a line or send me an email with your current address and contact information. If you know the status of any of our classmates of whom we have lost track, please share that information, too. Thank you for helping us to keep updated. 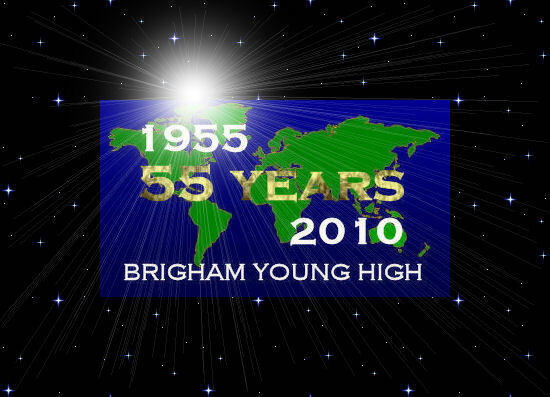 Following a great tradition of the BYH Class of 1955, the 2010 Reunion Committee produced its latest version of their reunion book. The Reunion Committee included Todd Britsch, Chair, and K. Dale Despain, "J" Stephen Jones, Gary D. Liddiard, Janelle Brimhall Lysenko & David G. Weight. Primary driving force behind this ongoing tradition is "J" Stephen Jones. Beginning with an introduction by Todd Britsch, 108 pages of history, updated class member biographies, faculty photographs, and cartoons, follow in an amazing record of this great BYH class. Wow! [Left to Right] Row 1: "J" Stephen Jones and Betty Clark Francis. Row 2: Kay Irene Johnson Van Dyke, Ann Romney Brockbank, Sharlene Taylor Sumsion, Jesselyn Nelson Pugilese, Carol Gleason Field, Virginia Rae Merservey Hepworth, Carol Noble Tobler, Janelle Brimhall Lysenko, LaWana Dix Charles, Joyce Crowther Johnson, Jennie Lin Poulson Strong, DeLores Graham Morain, K. Dale Despain, Gale Gagon Evans, Karen Leishman Allred, and Gary D. Liddiard. Row 3: A. Brent Brockbank, M. Byron Fisher, Thad Johnson, Toney Bentley, Grant Miller, Val Harris, David G. Weight, Donald Wright, Dean Allen, Lawrence Payne, Todd Britsch, Gary Lee Anderson, Robert Shaw, John H. Atkinson, Dean Maiben, Swen Nelson. Missing from picture but at reunion: Robert Hatch, Paul R. Hoopes and Jim Earl. 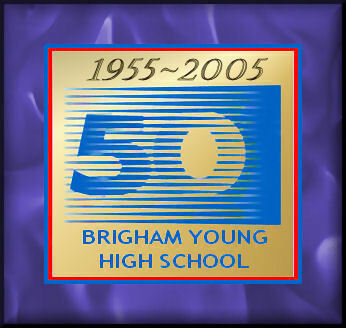 The 50th-Year Reunion for the Class of 1955 was held at Academy Square in Provo on July 2, 2005. "J" Stephen Jones gathered biographical materials and current email addresses. The Reunion Co-Chairs were Swen R. Swensen and Sharlene Taylor Sumsion. Reunion Committee members included: John H. Atkinson, Karen Leishman Allred, Todd A. Britsch, Gale Gagon Evans, Betty Clark Francis, "J" Stephen Jones, Gary D. Liddiard, David G. Weight and Kay Johnson Van Dyke. One of the highlights of the 50th Year Reunion was the publication of a keepsake 108-page reunion book. It was compiled by members of the 2005 Reunion Committee and produced by "J" Stephen and Barbara Jones. It contains an introduction by Swen Swensen, a brief illustrated history of BY High, a listing and photographs of all BYH faculty and administrators from 1953 to 1955. 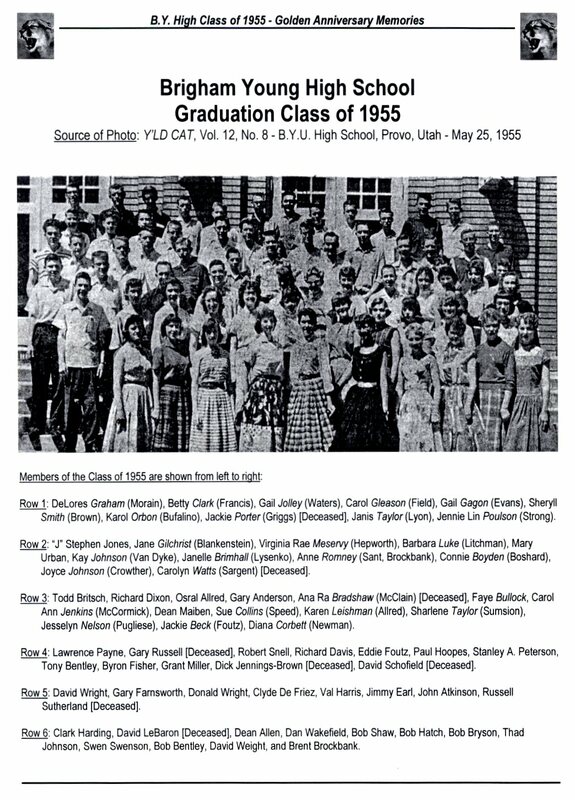 There is a photo of the graduating Class of 1955 (see below), and an amazing recounting of elementary school years through high school by Lifer Betty Clark Francis. Each member of the class, whether a graduates or honorary member, is outlined on a separate page. Every reunion class should be fortunate enough to have a book like this.